Oct. 7 @ 1:30 pm, Matiz Flamenco (Las Japonesas Flamencas) at Millbrae Japanese Cultural Festival. ​July 26, 2018 @ Private Event by Sol Flamenco. Sunday December 10 & 17 @ 4:30 - 6pm, Accompaniment Class for guitarists in SF. Saturday December 16 @8pm. City Dance Onstage at the Palace of Fine Arts. Sunday May 28 @5pm at Historic Hoover Theater, San Jose. Sun. Aug 7 Flamenco: Feria de Flores by San Jose Nuevo Flamenco in the Chinampa Gardens of the Mexican Heritage Plaza, San Jose. Sat. June 25 @ 7pm. Carolina Lugo & Carole Acuna Ballet Flamenco at Pena Pachamama. Friday May 6 @ 7pm , Sol Flamenco, Sebastopol Center for the Arts, 282 South High St.
Yuli will be performing with Carolina & Carole Ballet Flamenco & Guitarist, Gopal Slavonic! SF's very intimate performing venue! Enjoy delicious organic vegan foods and authentic flamenco in North Beach. It's a popular event so reserve your seats as soon as possible. Traditional Flamenco shows combines the pulsating sounds of footwork, song, castanets, syncopated hand clapping and guitar, painting a visual canvas in movement through dance. The relationship between all of these rhythmic essentials is riveting. Friday May 15, Sleeping Lady, Fairfax @9pm. Andrea Caneral's groovy cuadro celebrated the ERA of sleeping lady with Mark Taylor (toque), Damien Alvarez (baile), and Yuli Norrish (cante y baile). Matiz Flamenco had great fun with K3-K5 children at Clarendon, SF! Thank you for your good work! November 20 Thursday @7:30pm at Seahorse, 305 Harbor Dr., Sausalito (415)331-2899 We had a blast!!!!! Thank you! Cuadro Los Flamencos del pueblo: Jose Mendez, Ricardo Diaz, Andrea la Canela, Damien Alvarez, and Yuli Norrish! November 12 Wednesday @7pm at Le Bateau Ivre, 2629 Telegraph Ave., Berkeley. Thank you for another full house!!! Cuadro Matiz Flamenco : Damien Alvarez, Kyle Ickes, Laurel Metzey, Melina Berkov-Rojas & Yuli Norrish. We'll be back on 03/25/2015. Yuli will be singing for Theatre Flamenco! 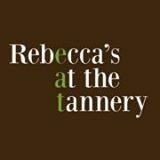 3066 24th Street, San Francisco CA 94110 | 415.282.3066 Reservation recommended. $15 cover. 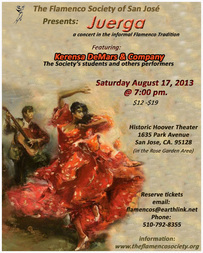 October 17 - 19: San Francisco Trolley Dance with Mision Flamenca. Thank you for coming! Matiz Flamenco had its first Flamenco Friday at Cafe Frascati, 315 S 1st St, San Jose, CA 95113, on 9/26@8pm! Thank you for your generousity! This Special Performance Project is funded by Azahar Dance Foundation. Tuesday, September 16 @4pm, Windsor Thank you for having us! Saturday & Sunday, August 30 & 31: Flamenco Fiesta Fin de Verano, San Diego. The 20th anniversary!!! Cuadro Matiz Flamenco : Aldo Ruiz, Kyle Ickes, Laurel Metzey, & Yuli Norrish. Thank you for making FULL HOUSE ! We'll be back on 11/12. Cuadro Matiz Flamenco, Aldo Ruiz, Gopal Slavonic, Yukie Takahashi, & Yuli Norrish, was back to San Jose! 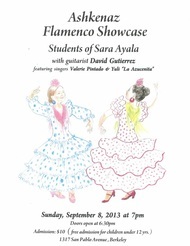 Yuki and Yuli performed at La Tania Flamenco School Show! Another sold out year! Aldo, Yuki, and Yuli will be performing there again! 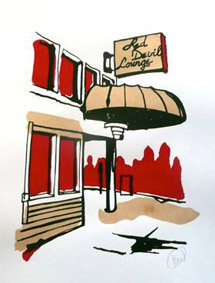 Valentine Boisnard's art opening reception + BD party + Flamenco Fiesta on St. Valentine's Day!!! Yuli will be singing with Bill Burgess! Please come join us!! Yuli & Aldo joined Cachito de Flamenco and performed 2 shows at 2 libraries on the same day! Thanks for great artists and enthusiastic audience. Private event at Carlisle in SF on 12/29/2013 at 4pm - 5pm. Las Japonesas Flamencas will be back! Matiz Flamenco will be performing at a holiday party of Little Brothers - Friends of the Elderly! Saturday, December 14th between 11:00 a.m. to 1:30 p.m.
Friday, November 1st at 6-10pm. 26 7th St. @ Market St. 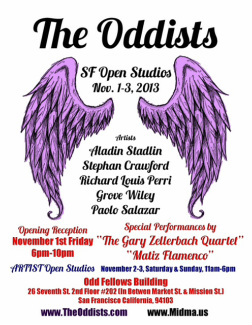 The Oddists presents Stephan Crawford, Richard L Perri, Paolo Salazar, Aladin Stadlin, & Douglas Wallace. Matiz Flamenco will be back around 8pm! Sunday, September 8, 2013, at 7pm. Come support Ashkenaz Flamenco Showcase by students of master teacher, Sara Ayala with guitarist, David Gutierrez and featuring singers, Valerie Pintado and Yuli "La Azucenita"! Families and children are welcome! Yummy food & drinks available! Aldo Ruiz will be performing! This will be an evening of fusion! 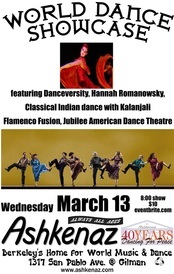 Balkan and Middle Eastern music and dance combined with Flamenco music and dance. Flamenco guitarist Gopal Slavonic is joined by Ryan Feldthouse and dancer Chantal Bianca Schoenherz of The Hot Blood Orkestar, Lars Tergis on fiddle, Sean Tergis on percussion, and flamenco dancers Andrea La Canela and Yuli Norrish. 2 sets with intermission. 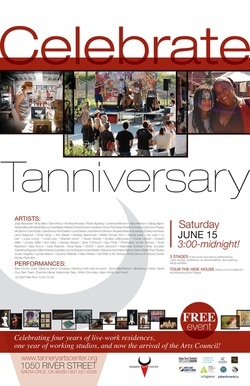 Admission is $10 donation for the artists! Tapas provided and drinks for sale! Enjoy the summer evening with entertainment, fine wine and beer! 3 sets of Flamenco show! Julie Innocenti and her beginning students: dance and palmas. We have a small amount of Community Tickets available. 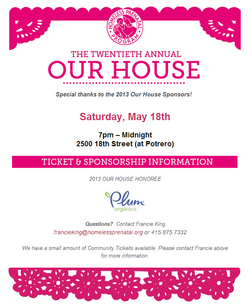 Please contact Francie above for more information. 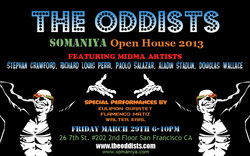 Friday, March 29th at 6-10pm. Special performances by Euripion cuartet, Matiz Flamenco, and Walter Earl. Matiz Flamenco performance will be around 8pm. 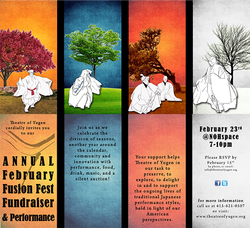 Fusion Fest at Theatre of Yugen, SF on 02/23/2013 We had a blast !!! Thank you! !